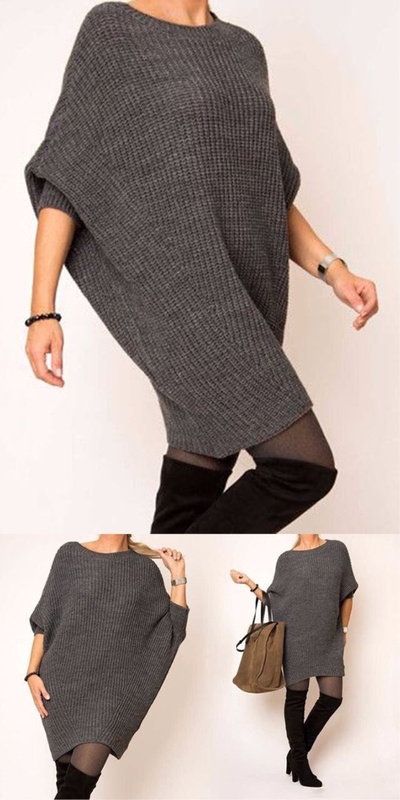 Knitted dress oversize knitting needles with bat sleeves - perfect! It will look great on any figure. It can be worn as a tunic with trousers, leggings or as a dress. It is quite simple and suitable for beginners. The dress knits with needles, a simple pattern - an English gum and a simple pattern. A dress with sleeves is a bat - it's very stylish, quite comfortable. Such a thing will be mega trendy! Yarn of melange wool. At 46-48 size - 6 coils of 250 meters. Dial 115 loops. Additions to do in every 7th row. Knit an English rubber band, only on one side to loops without a crochet. Such an elastic band in jersey is called semi-patented (half-English, pearl). English gum 1 * 1. Add hinges not at the edges, but in the center to make the wedge. From the central 7 loops on each side of the broach in each row 7, one loop. Adding is made from a broach between two loops. Cross the thread from the broach and tie an additional loop. I want to draw your attention to the fact that the model is connected with an English rubber band on one side, the other side must be tied, as the loops look (front-facing, purl-purl). Before and backrest knit separately, then stitched. Then, on the edge, loops are typed onto the sleeve and knit with an elastic band 1 * 1 to the desired length.